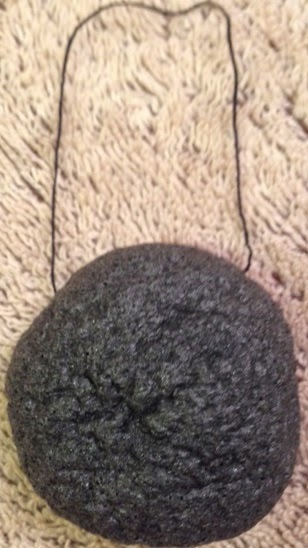 I was given the chance to try out a different kind of facial sponge - Konjac Facial Sponge with Activated Bamboo Charcoal. Konjac is a moisture rich plant fiber which balances the acidity of the skin's impurities and oils. The sponge gently massages the skin, breaks down dirt, stimulates blood flow and new growth of skin cells. It is great for all skin types even super sensitive. The sponge improves your skin texture by deep cleaning. Since it stimulates blood flow is gives you brighten looking skin. 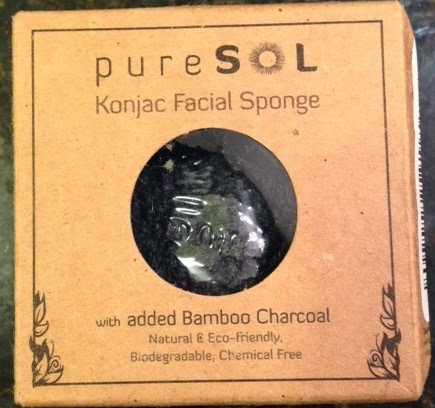 The bamboo charcoal absorbs oils so it tightens pores and helps prevent spots, blackheads and breakouts. The sponge is 100% completely natural, eco-friendly and free of parabens, sulfates and chemicals. It is biodegradable, cruelty free and vegan. After use, you can compost the sponge. It comes with a handy suction hook so that you hang it to dry. The sponge is hard when you take it out of the package. You soak it for a bit in warm water and it completely softens. What I liked is that the sponge was very gentle on my face and where I had dry patches on my skin, they were gone. For me the effect was of a scrub without the harshness. This is a fabulous product and I highly recommend this.